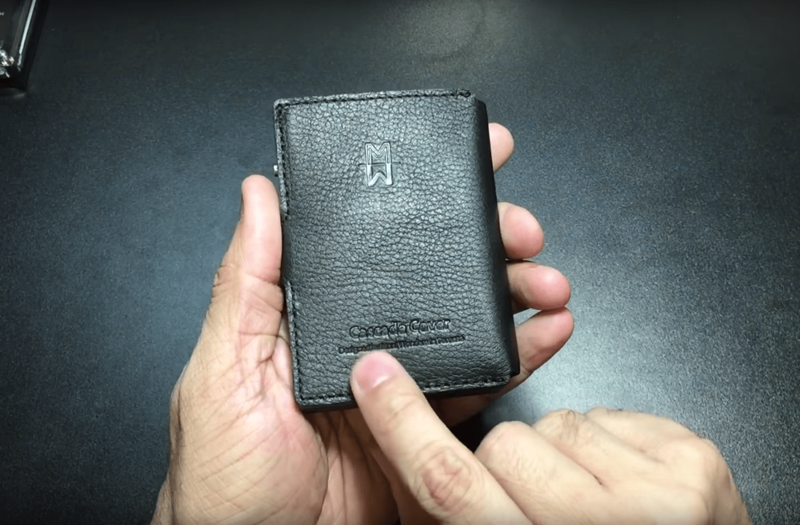 Hey guys, today we’re going to be looking at the Cascade wallet from the company Mani Wonders out of Toronto, Canada. I’ve been a little bit of a wallet geek lately and trying out different styles of wallets. This particular one is very interesting, sleek and minimal. I love the way that it holds your financial cards and your cash and everything else in one place. Most importantly, the card holder wallet provides RFID blocking capabilities so to protect you from financial information and identity theft. In addition, card protector wallet looks really elegant and it has a couple of different features and add-ons. 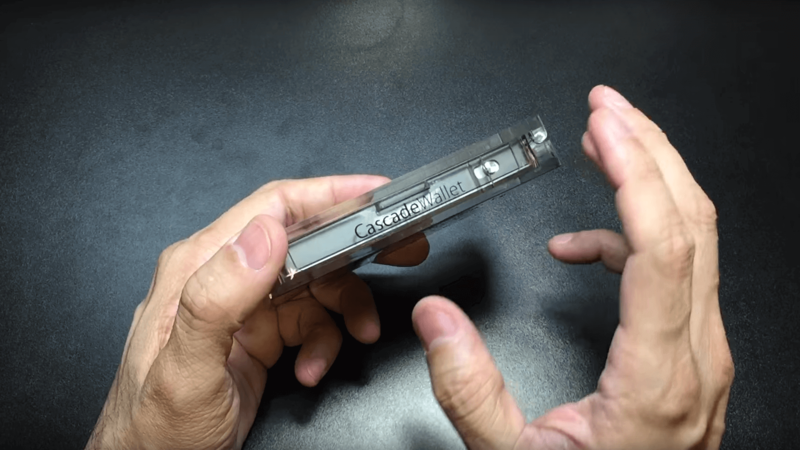 The Cascade Wallet comes in this really awesome plastic see-through box. You have a couple of different color combinations that you can choose from and customize to make it your own. When you open up lid, it’s got a couple 9-inch open, you can go ahead and take the wallet out. 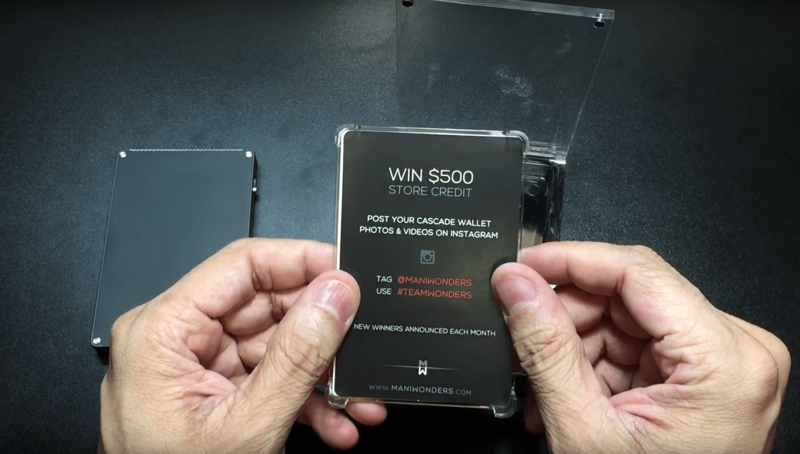 It comes with a Promo card – win $500 store credit by posting some pictures of your wallet to their social media and an instruction booklet comes in English and French, illustrates the functions of the wallet. The Cascade Wallet is very clean with minor branding and four little bolts with diskwave finish which holds the aluminum body together. On the right panel of the wallet, a slide button switch is present. The left panel of the wallet ahs two ring ports which attaches to the Leather Cover accessory. The back of the wallet has branding of the company which includes a mirror finished Mani Wonders Logo, Laser Engraved text of the Product Name – “CASCADE” and Laser Engraved text – “Designed by Mani Wonders in Toronto”. The Money clip is retracted to slip in business card, receipts and cash bills. It’s a very cool spring loaded functional design with the perfect sized thumb groove for easy ejection. The Money Clip sits flush with the aluminium metal body when it is not carrying anything. This ensures to keep the principle sleek form factor. The top door opening mechanism has a zippo lighter feel. The top door has small teeth like grooves to create friction when flip opening the top door. In order to eject your cards, flip open the top door and slide the button up and the cards magically springs up and stacks in cascade fashion. After completing the payment, reinsert the card, slide the button down and close the top the door. The Cascade Wallet is fully enclosed aluminium body. The Cascade Wallet comes in different custom colors – Gunmetal with Chrome Trim, Silver with Black Trim, Gold with Rose-Gold Trim and All-Black with Black Trim. The fit and finish on the wallet is excellent, functional designs are hidden and there are no exposed screws besides the four disk wave finishes. The edges are polish chamfered; feels very smooth and round. The Card Slider Wallet makes for a perfect luxury holiday gifts item. I did show it off to my peers to get their feedback – “It feels like it’s built very sturdy.” “It’s built like a tank”. I do want to note that I would probably recommend carrying this wallet either in a front pants pocket or in your breast pocket in your suit or jacket specifically because of how rigid the wallet is. I tried using it in my back pocket and found it to be uncomfortable. My recommendation is this is more of a front pocket wallet and you can use it in your back pocket if you desired. The Cascade wallet holds up to 5 financial cards or up to seven cards with non raised letterings like rewards cards or driver’s license or IDs. I have a mixture of five total cards here and easily slide them in very smoothly and then you can just close the top door. It stores them perfectly in there now and when you do need to access them, all you have to do is go ahead and open up the top door lid and using the push button on the side to slide up the cards for easy access. The credit cards will be cascaded uniformly. That’s where the name is derived, Cascade Wallet. Once the side button is released, all the cards and IDs fall back into place again. If you need to use access one of your cards again just slide it up. It’s that easy. Go ahead, pull out one of your cards, tap to pay and put it right back into any position and then let the slide button go and watch them as the cards neatly fall into place. The next time you want to access the cards, they are going to be right there along with the rest of the other cards in sequence. I really like the functional design of the money clip where I can easily fold cash in half and clip. I know some of the smaller kind of minimalist wallets force you to fold your bills two or three times. I kind of like to keep it this way so all you have to do is just lift up the clip, slide your cash in and hold it in place. 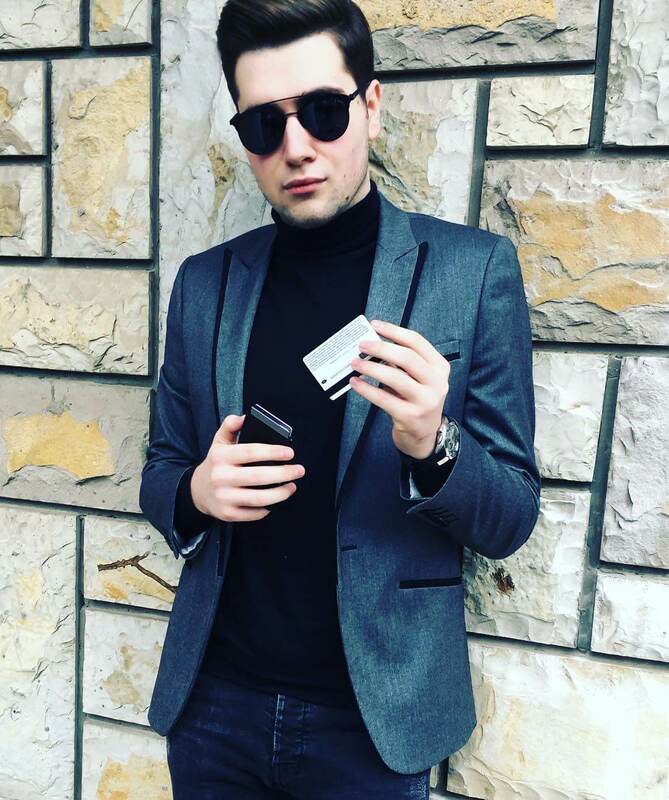 I can now take this business card, parking ticket, receipt and slide it in along with the cash and the right amount of pressure is applied to hold the cash and business cards in place. Boom! It’s really a nice slim, sleek, and organized wallet. Once all the items are removed out of the Money clip, the money clip recess back into the wallet itself and sit flush with the aluminium wall of the wallet. Almost Unnoticeable! In addition, the Cascade Wallet has an accessory companion that can be attached to the wallet, called the Detachable Cover. The detachable cover is made of high quality, premium leather with hand stitched layers to enhance the luxury aesthetics. The Top Grain Leather Cover provides extra slots to carry more of your stuff and taking less of your pocket space. The detachable cover comes with four slit opening to store your rewards cards like Air Miles, Optimum, and back slot for cash, receipts, key fobs and more.The leather cover comes in different custom colors – Brown, Navy and Black. Very Compact! The Detachable cover comes with two little custom designed studs in the main spine and these studs correspond with the two holes on the side of the Cascade Wallet. The Cascade Wallet and Detachable Cover clip in and has very strong retention and you can be rest assured that it will not come loose. The complete wallet has a formation of a mini booklet. it’s got a Velcro to neatly conjoint the flaps together. This keeps the form factor very neat, organized and clean. On the outer layer of the leather cover, the branding is debossed which includes a Mani Wonders Logo, the Name of the product – “Cascade Cover” and text – “Designed by Mani Wonders in Toronto” in fine print. The Top grain leather feel very smooth; looks and smells very elegant, befitting of a Luxury Wallet. If you are going out to an upscale affair party, strip down to a slimmer wallet by detaching the leather cover by easily pulling the two little studs out. The night life takes on a new dimension. The Cascade Wallet carries the predominantly used cards and most importantly, becomes a conversation piece at your next cocktail party.